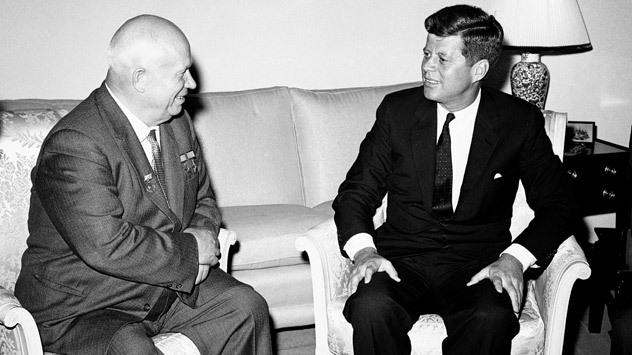 The world held its breath as Khrushchev and Kennedy raced to avert a nuclear confrontation. RBTH sketches a timeline of the crisis and the events that led up to it. Exactly 50 years ago, in October of 1962, relations between the Soviet Union and the United States hit crisis level: Russians refer to it as the “Caribbean Crisis,” while Americans call it the “Cuban Missile Crisis.” For 13 days in fall, the world stood on the brink of nuclear disaster. At the last moment, the situation was saved by Soviet leader Nikita Khrushchev and U.S. President John F. Kennedy, who came to an agreement and averted nuclear war in the process.